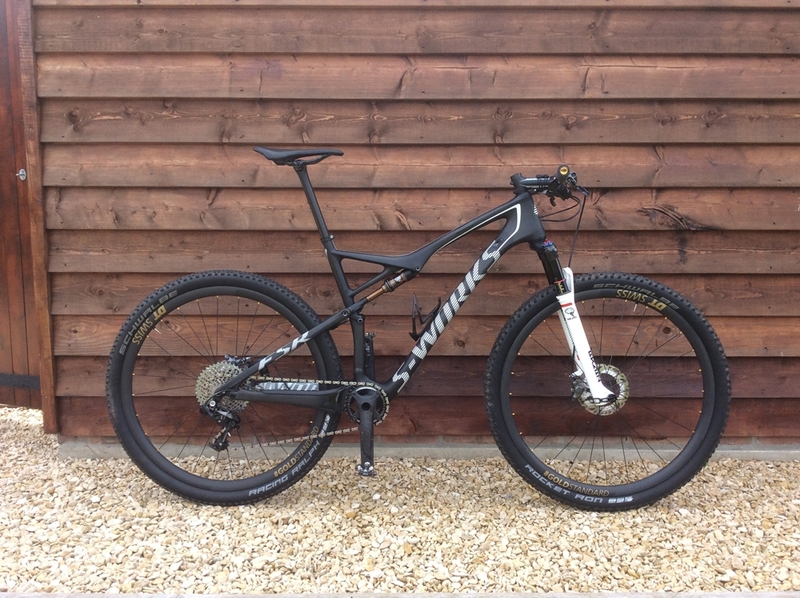 Specialized Sworks Epic WC is the second Race focus review we've received from Sam Humphreys, He's piloted the bike to multiple wins already this season! Words By Sam. My love affair with the epic started way back in 2003 when I took delivery of my very first Sworks bike……back when everyone was racing XC on hardtails, this was a bold statement indeed. I was regaled with tales of how suspension bikes were unreliable, heavy and just not competitive, most of this was in fact true! But I was a trailblazer and felt it was the future. My first ride was a two hour XC loop that I knew inside out, I set the quickest time ever on that ride…….and then promptly sold the bike and got an M5 Sworks hardtail! I just could not get the aesthetic to sit comfortably…..and all that extra weight of the shock, well surely that would slow me down, despite evidence to the contrary. Fast forward to 2016 and I am once again trawling the internet collecting parts to build my dream XC race bike for the upcoming 2017 season. At the end of the “16” season, I made a decision that I wanted to be unsponsored in terms of equipment to allow me complete freedom to use what I wanted. This may seem a bit odd, but I have raced for 25 years, been a National champion, top 5 in the worlds and lived and raced in France on the road….with much of that time spent using equipment that I would not necessarily have chosen to buy myself! So being lucky enough to be able to afford to……I built my own. I chose the frame as I feel it’s the best full suspension format available for my riding style, I often use bigger gears and ride out of the saddle a lot and so wanted a very stiff, very light frame that pedalled more like a solid rear end that had the capability to smooth out the trail buzz and bigger hits, its also a true 4 bar linkage so naturally pedals better than some of the more active or poorly placed pivot designs of late. I also felt that at some point I might do some longer events and so wanted the ability to fit two bottles. I paired this up with the Rockshox SID World Cup Fork, also with the brain fitted, as after a season spent on a Scott Spark with what I felt was a “messy” handlebar set up, I was craving the clean line bar set up that running dual brain systems would allow me. Wheels came next and I selected to go that touch wider with the DT Swiss XCM gold standards, I feel rotating weight is the most important place to save on, so I use 2.1 tyres, but on the 24mm internal width rims, they come up wider, whilst being lighter than many 2.25 offerings, it’s a personal view, but hey….its my bike! Next up, and following the light stiff approach, I went for the Sworks carbon crankset, very light and very stiff. With 104 bcd it means I can only really go down to a 32t ring without the need for spacers, but most of the year, I will typically use a 34. There are a few reasons for this, riding style being one, but also in muddier races, it means I will ride more in the larger rear sprockets which tend to clog up a lot less than the smaller ones (think Wasing southern this year!!!) this all spins up on a Chris King BB. Drive train is Sram XX1 11 speed ( shifter, cassette, chain) nothing against Eagle…..I will just wait till it comes down in price a bit, and to be honest, it seems to struggle in really heavy mud, but I think that is a bit of a 1 by issue anyway. Rear mech is x01, it’s a bit more of a vulnerable component and so this is a bit cheaper to replace if I have an issue, its also only 6 grammes heavier I think! 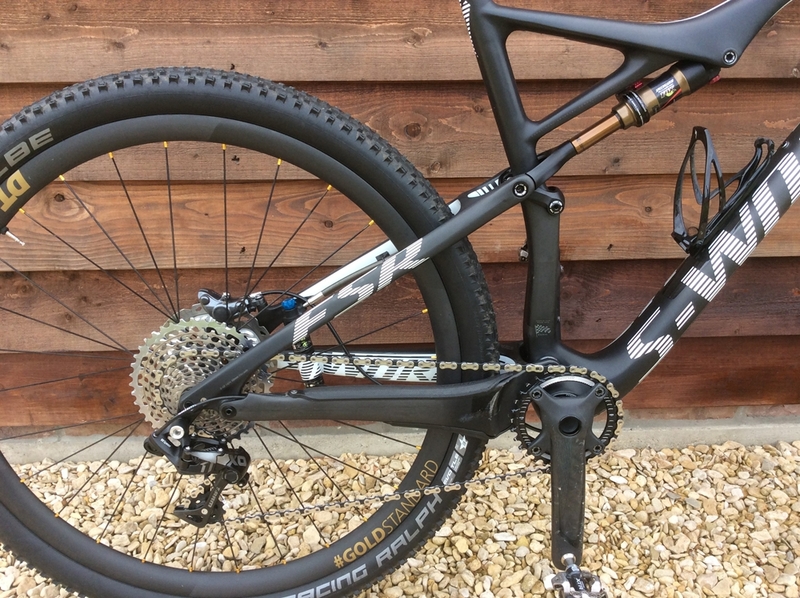 Moving on to brakes, for me it had to be XTR race…….light, easy to set up and have a fantastic lever feel, with the bonus of not using nasty DOT 4 or 5.1 fluid. This probably seems a funny motivator, but when most frames these days are internal cables, meaning a re bleed of the rear brake when building, I just didn’t want to risk getting nasty stuff on my beautiful FACT11 naked carbon frame! I use 160mm rotors with center lock hubs, a really simple to use system. Finishing kit consists of Sworks carbon flat bars, cut to 690mm, Carbon Sworks in line seatpost, Sworks carbon railed saddle and a Ritchey WCS 220 stem in minus 17degree! Topped off with ESI silicone chunky grips. 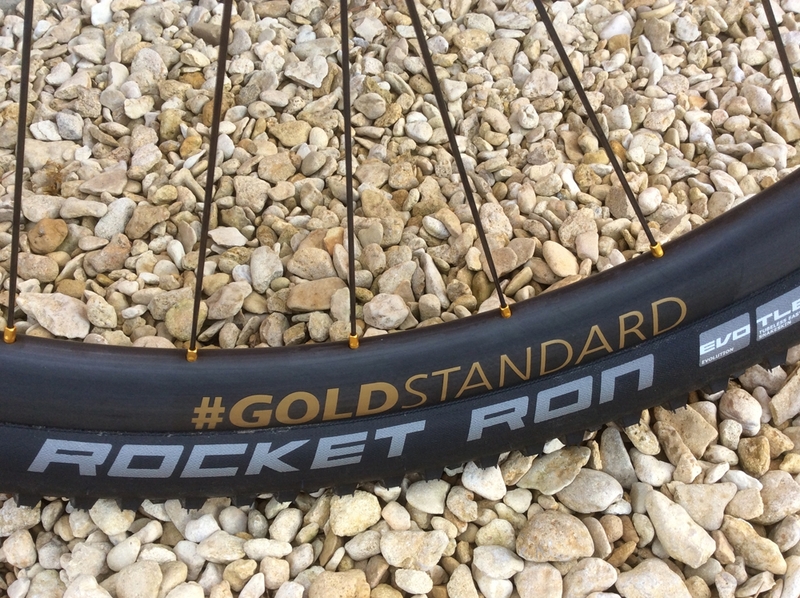 Tyres are really course specific and is a component I change a fair bit, I switch between the ubiquitous Ralph/Ron set up, sometimes Sworks Fastrak’s …….and on the odd occasion, I might use the Sworks renegades…..but it has got to be totally dry for those! By now you will have got the idea……it’s a bike built to be stiff, light and fast, and so far, I have loved it. I know bikes are a really personal thing and there are all sorts of reasons we can give to justify the components we use. Modern courses have moved towards the more technical and I am fortunate that simply because of the amount of time I have been racing, I am fairly comfortable to keep a pretty aggressive set up and still mange the courses that are currently being offered up, but I know this has been something that has influenced bike design and set up of late and has seen a lot of bikes get “slacker” in the front ends to compensate………but when you are over 6 foot, bikes tend to get pretty long in the wheelbase, and for me, they become a bit of a handful in the faster, tighter singletrack but with the really steep head angle (comparatively!) of the WC frame, it retains it’s sharpness that my XL Scott spark never had. This has been a strange experience, writing about my own bike. I cant really do a “traditional” generic report that we all read in the mags……you know, stuff like “tangible increases in vertical compliance” and the like! But I hope this has given you a flavor of what I ride, and why I chose some of it. I hope to enjoy the rest of the 2017 season , but so far the bike has been amazing and taken me to wins in the first two Southern’s, the first National and see’s me sat number one in the National rankings….its all about the bike, believe me!